The band was formed in September 2005 under the name AND SINCE FORGOTTEN. “Beyond The Gate” is the band’s sophomore full-length work (their debut was also released through Victory Records) and the North Carolina extreme metallers are ready to bring hell on earth. This band must adore THE BLACK DAHLIA MURDER; there is no other explanation for the incredible similarity between those two bands. 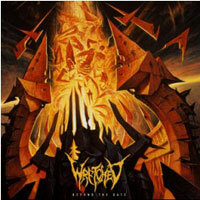 A combination between melodic Death Metal and Deathcore, wicked melodies and a sonic chaos in general are exactly what characterizes WRETCHED. If you bypass the “similarity issue” mentioned above then you have nothing to fear since this quintet is a dynamic band with some brilliant ideas, incredible technique and huge doses of brutality and melody that seem to be the perfect match. If you like your extreme Metal modern, “proggy” and somehow evil, then WRETCHED are probably a damn fine choice for you the next time you visit your local record store. The only things that kind of hold back the album are the more than needed acoustic, orchestral, sample parts (you even find an old Spanish or whatever tune), as well the fact that the band could work slightly on crafting a more personal sound. Not because they sound bad, but because they could sound way better. I guess we have some talented guys here and I am sure going to be watching them from now on.